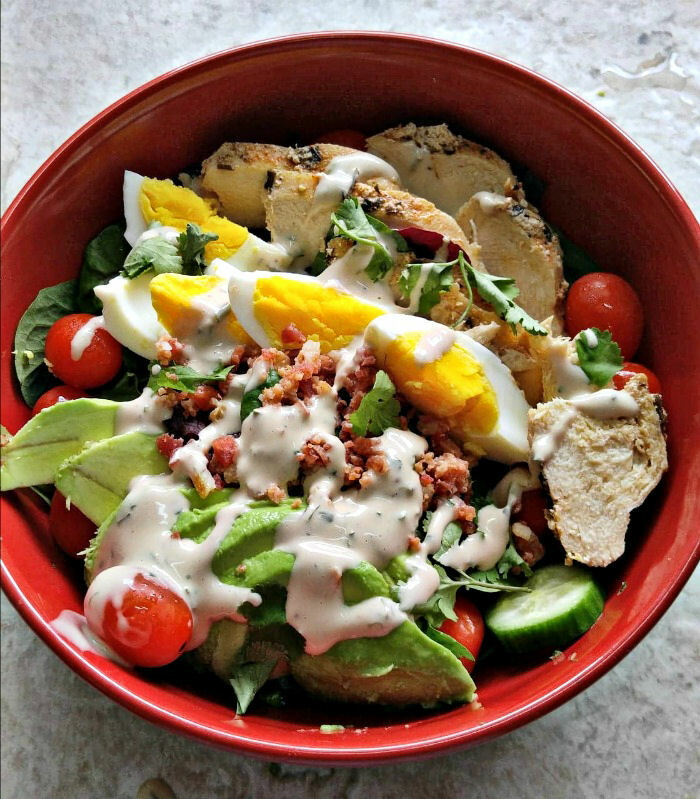 This delightful California Cobb Salad is a wonderful blend of mixed greens, grilled and seasoned chicken breast, with bacon, eggs and vegetables. The homemade creamy ranch dressing tops the salad off beautifully! 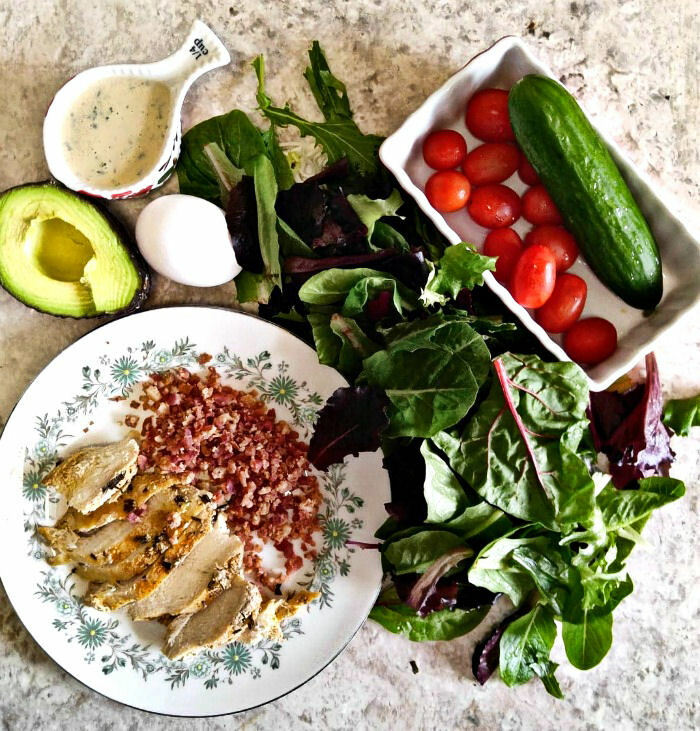 This salad is one of my favorite Whole30 recipes and also fits the Paleo diet, as well. It’s time for some California Dreaming – Cobb Salad Style. This traditional restaurant favorite is my go to choice when I eat out for lunch and want to have a great taste but still keep the meal fairly healthy. I really enjoy making salads with proteins in them. They are very healthy and make a great lunch time option. See my Keto bacon and broccoli salad for another option. 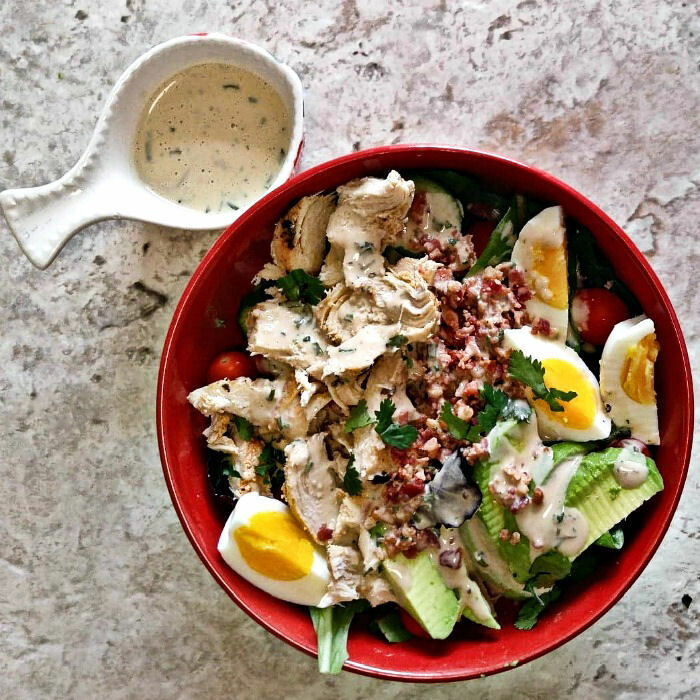 The other challenge that you will face for making a Whole30 California Cobb salad is the dressing. Most commercial dressings are a no no since they contain sugar or soy products. The answer, of course, is to make your own! See my Whole30 Ranch dressing for a great tasting topping for this salad. I used the traditional Cobb Salad ingredients with a few extra that I enjoy in salads. (I add baby cucumbers and Salad greens instead of iceberg or Romaine lettuce.) I also don’t use any cheese since this is not allowed on either the Whole30 or the Paleo diet. 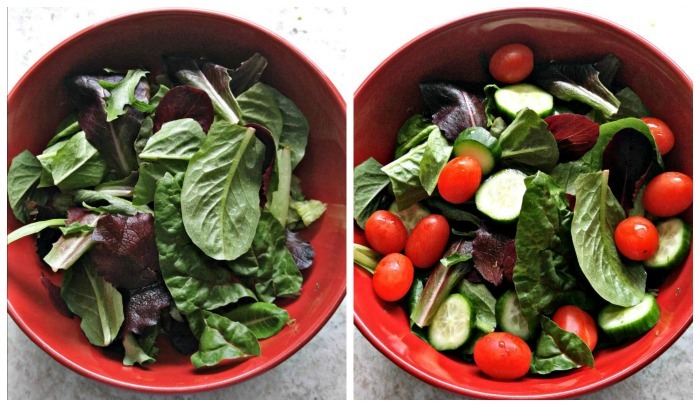 Start by placing your Romaine lettuce at the base of a large salad bowl. Many Cobb salad recipes use only this type of lettuce but I like to add to it since I’ll be omitting some other flavors. Top it with the baby mixed greens and add the sliced baby cucumbers and tomatoes. 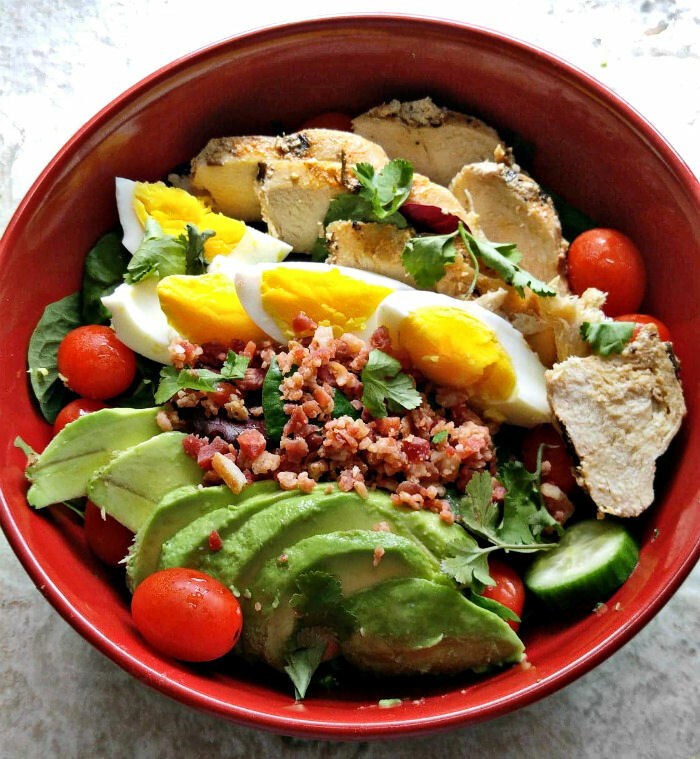 Work from one side of the bowl to the other to arrange the cooked chicken slices, quartered hard boiled eggs, slices of avocado and pieces of cooked, crumbled bacon. Top the salad with the Whole30 ranch dressing and garnish with some fresh chopped parsley or cilantro. This salad is hearty, healthy and delicious. 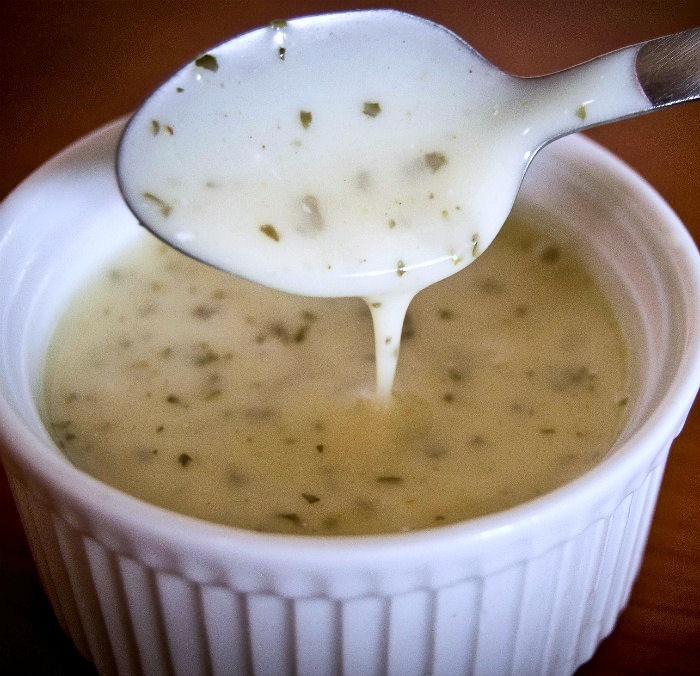 Each bite gives a different taste sensation lovingly drizzled in a creamy ranch dressing that is just full of the flavor of fresh herbs. This recipe makes a HUGE salad, but you won’t mind because the bowl is just full of healthy ingredients. I love this so much that I make it several times a week! The salad works out to 587 calories including 2 tbsp of the creamy ranch dressing. For two other healthy lunch time or side dish salads, try this Greek Chopped Salad or my Mediterranean chicken salad with a home made dressing and marinades. 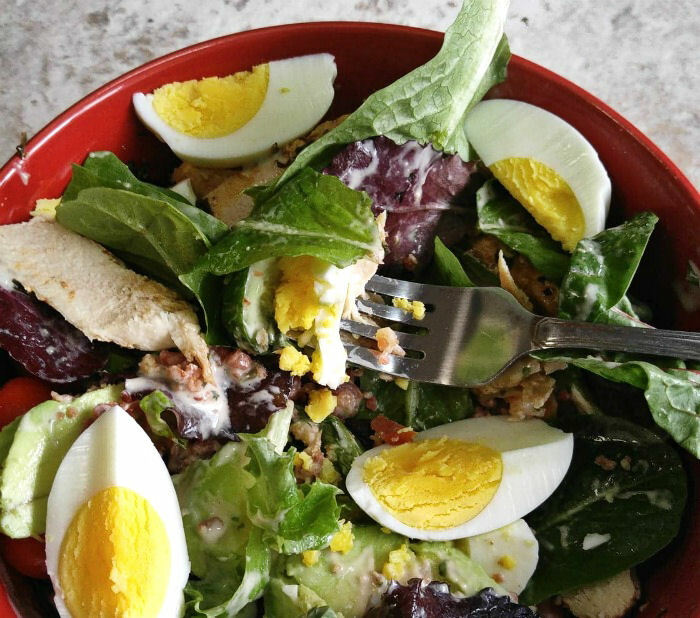 This delicious California Cobb Salad is a wonderful blend of mixed greens, grilled and seasoned chicken breast, with bacon, eggs and vegetables. The homemade creamy Whole30 ranch dressing tops the salad off beautifully! 1 hard-boiled egg, peeled and quartered lengthwise. 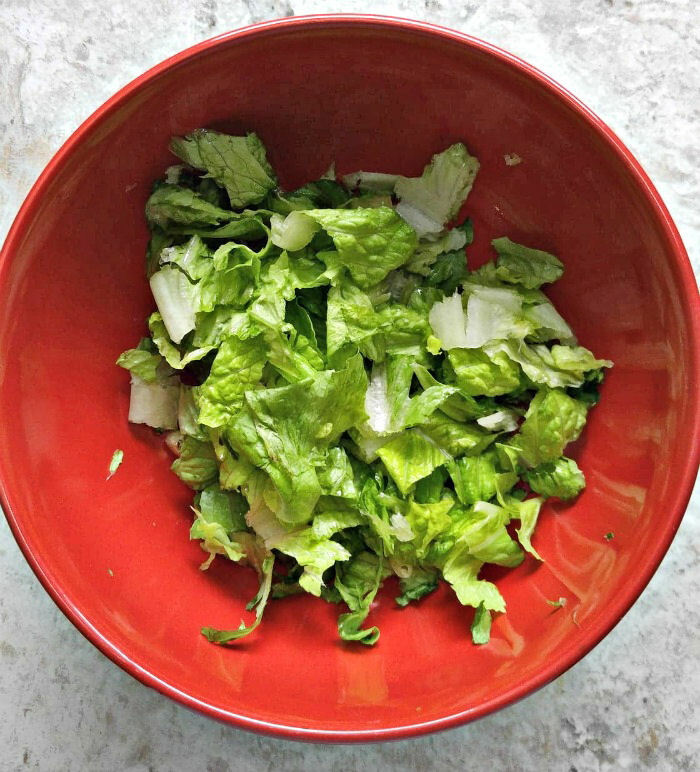 Place the Romaine lettuce on the bottom of a large salad bowl. Add the mixed greens. Add the tomatoes and baby cucumbers on top of the greens. Work from one side of the bowl to the other, placing the chicken breast slices, quartered egg, baby pieces and slices of avocado until the top is covered..
Top with the ranch dressing and sprinkle with parsley or cilantro. Makes one very large and hearty salad.